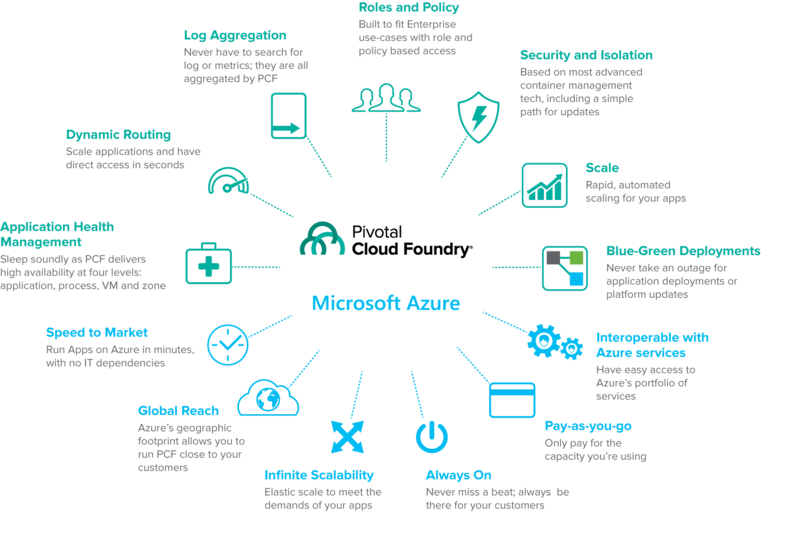 Pivotal Cloud Foundry®, running on Microsoft® Azure™, helps enterprises execute their digital transformation strategies. Together, Pivotal and Microsoft provide a comprehensive continuous delivery platform that accelerates application development—for Java and .NET applications alike. Coupled with Azure’s global presence and rich application services, developers can focus solely on building innovative and differentiating functionality. Pivotal Cloud Foundry (PCF) is a cloud-native platform for building and deploying next-generation applications. Based on open source technology, PCF enables enterprises to rapidly deliver new experiences to customers by building and deploying new applications quickly. Teams can use any language/runtime and leverage various backing services, deferring much of the operational complexity to the platform. Microsoft Azure is a growing collection of integrated cloud services—analytics, computing, database, mobile, networking, storage, and web—for moving faster, achieving more, and saving money. Azure is an open and flexible cloud service platform that supports the same technologies millions of developers and IT professionals already rely on and trust.